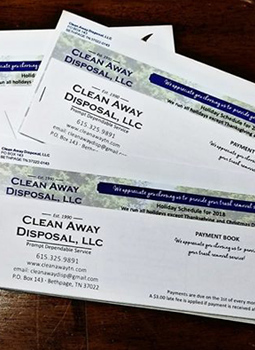 Clean Away Disposal, LLC requested custom designed payment book and brochure for their annual mailing. They are a family owned and operated business for over 20 years. Their reputation as a professional company with prompt dependable service is more than a slogan to them. They genuinely appreciate their customers and employees. Since they stand out in their industry they wished their upcoming mailing to do the same. Their coupon payment books looked generic, like every other company in the area. The brochure, that accompanied the payment book in the annual mailing, gave the holiday schedule, a list of services and policies and was also generic to read and perhaps even ignored. The 2 sided, tri-fold brochure also added additional weight to the mailing which required more postage. 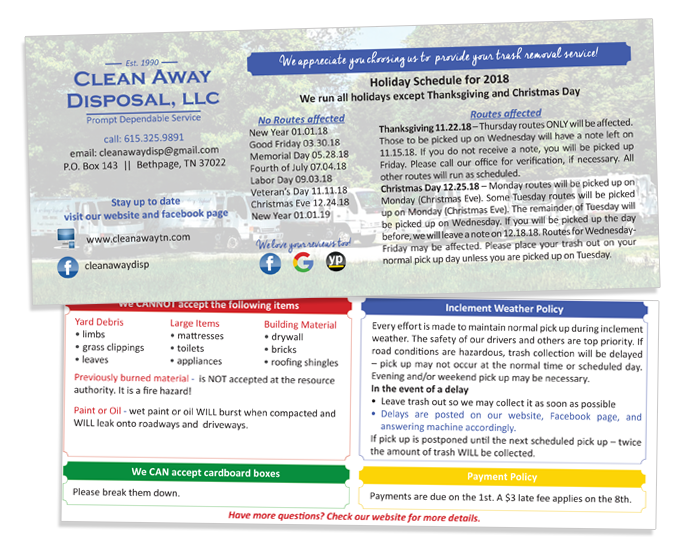 In additional to these needs, Clean Away Disposal, LLC also wanted to promote their social media channels and website as this is the fastest form of communication with their customers in case of weather delays and holiday schedule reminders. The monthly coupon payments were customized with larger text for the payments and due dates and the sections to be filled in with Account number, name and address were also increased for easier reading and writing. And there was room for a monthly message. The size of the brochure was changed from 8-1/2″ x 11″ (double sided) to 3-1/2″ x 8 1/2″ double sided. The content was reduced down by using bulleted text and grouping content into color blocks for quick reading. With the use of color and graphics the simplified brochure is inviting to read while giving their customers the needed information. This change in the brochure all saved money in the printing and additional postage. 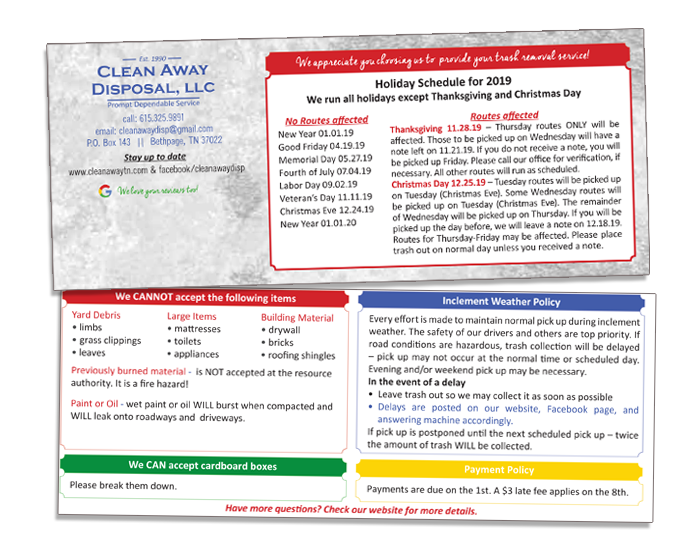 Overall design was working, but this year wanted the dates to stand out more, remove some of the social media and be able to add an address label directly to the insert. The back side with the policies had no changes. The pick-up dates and holiday schedule were placed in a white box, same shape as the back side. The contact information was moved and simplified to allow room to allow for the address label.